BLUES LEGEND BB KING has died in Las Vegas at age 89, his lawyer has said. Attorney Brent Bryson told The Associated Press that King died peacefully in his sleep at his home in Las Vegas. 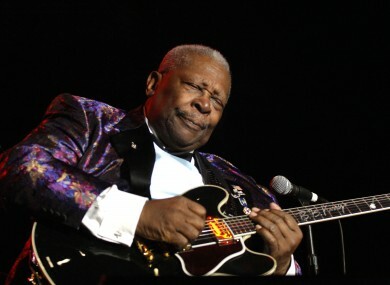 He played a Gibson guitar that he affectionately called ‘Lucille’ and was not only the undisputed king of the blues, but a mentor to scores of guitarists including Eric Clapton. AP with reporting from Daragh Brophy. Email “'King of the Blues' BB King has died, aged 89”. Feedback on “'King of the Blues' BB King has died, aged 89”.